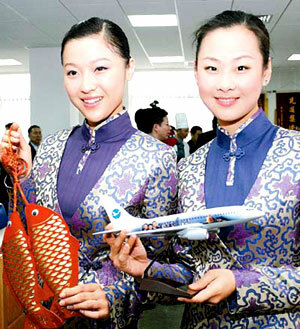 Xiamen Airlines is a Xiamen based airline carrier in China. Founded in the year 1984, Xiamen Airlines has its main hubs at Xiamen Gaoqi International Airport and Fuzhou Changle International Airport. The airlines has grown its fleet size to 43 and flies to 54 cities. The parent company is China Southern Airlines which is the major stockholder for Xiamen Airlines. Xiamen Airlines passenger fleet comprises of several aircraft type models such as Boeing 737-300, Boeing 737-500, Boeing 737-700, Boeing 737-800 and Boeing 757-200. The frequent flyer program for Xiamen Airlines is called the Egret Card. 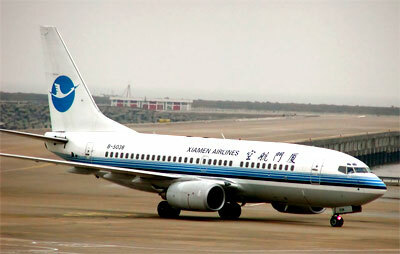 Xiamen Airlines operates Boeing 737 Passenger (All Series) in its passenger fleet for all its flights. Check flight schedule, flight status directly from Xiamen Airlines official website. You can also check on the cheapest airfare, flight schedule, flight status, airlines offices, contact number, airlines packages, air cargo partners, air ticket prices and booking procedure, international airfares, frequent flyer and other flight information and travel deals and packages. When you are making an airfare booking, select from either economy airfares, business class airfares or first class airfares whichever you prefer. Have a pleasant flight journey and enjoy your holidays or business trip!